Discovered at the tale end of the 18th century by a 16 year old, the Money Pit goes down at least 90 feet and contains man-made items at that depth. Exploring further depths has proven difficult, leading to cave-ins and flooding, and resulting in six deaths. (Some ascribe the difficulty to a series of booby traps set by whomever buried the items.) We don’t know what’s down there, but we do know that it there’s something in the pit which, by almost all accounts, shouldn’t be there. While some believe that the Money Pit is a naturally occurring sinkhole, which, over time, swallowed up the tools and materials in the area, the belief that the Money Pit is something larger has found a huge audience — including Franklin Delano Roosevelt, allegedly. This picture purports to be him with some friends at the site of the Money Pit during a 1909 excavation attempt. Those who believe that there is treasure at the unfound bottom of the pit cite to a number of stories and theories. Allegedly, at about 80 or 90 feet below the surface, laid a large stone with symbols carved into it. Attempts to decipher the message yielded a promise of riches: “forty feet below, two million pounds lie buried.” But that stone was last seen in 1912, and no images of it exist today. (One site, of questionable authority to say the least, claims to have an accurate depiction of the symbols.) It may have existed; it may be the stuff of legend. If it’s true, it’s lead to incredible theories as to what’s buried deep below. Some believe it to be pirate treasure, others think that Spanish Armada sailors or British troops fleeing after the American Revolution dumped items of value there. Another theory holds that, at the close of the Seven Years War, French troops moved the coins held at the Fortress of Louisborg (on mainland Nova Scotia) there. No one is certain what lies beneath, and the mystery will likely go unsolved for many decades. Currently, Oak Island is privately owned, making further exploration of the Money Pit at the whim of its owners, who have shown little interest in allowing for future, dangerous expeditions. Bonus fact: The most likely place to find buried pirate’s treasure? Long Island, New York. William Kidd, a Scottish sailor executed for piracy in 1701, is widely believed to have buried some of his loot, with the intention of using it as leverage if he were ever brought to trial. (This tactic obviously failed.) We know for certain that he buried some treasure on Gardiners Island, a small island off the north coast of Long Island, as the treasure was unearthed and used as evidence against him at trial. From the Archives: Sad George: The bonus fact is about FDR. 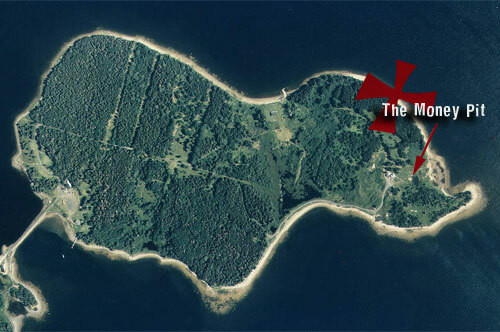 Related: The Lost Treasure of the Knights Templar: Solving the Oak Island Mystery by Steven Sora. 3.5 stars on 56 reviews.